Aerogels are the lightest of all solid substances. Chemically, they are identical to silica glass, but they have a very porous internal structure, which leads to a number of interesting properties. They are excellent thermal insulators; they have a huge internal surface area; they are transparent; they can absorb a large amount of kinetic energy. Aerogels were first produced in the late 1920s. They were first marketed as a paint additive, then as thermal insulation. Their production today is hindered by their cost. Aerogels are expensive because of the time and energy required to produce them. Aerogel production involves two main steps: the preparation of a wet silica gel, and the removal of the wet matrix by supercritical fluid drying, a process requiring high temperatures and pressures. 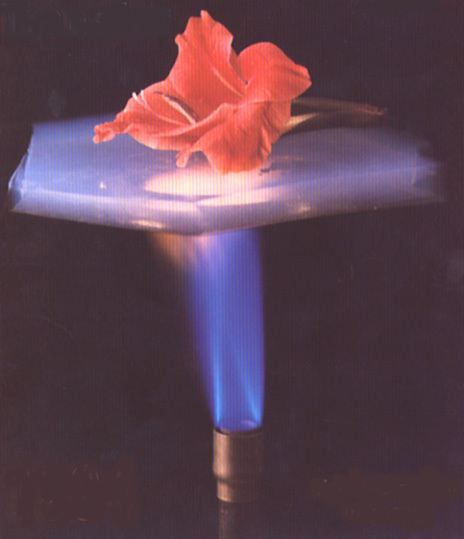 Today, aerogels are sold as thermal insulation for specialized applications. They may also find use as temperature-resistant windows, and in the space industry. One of the most promising applications for aerogels is as a shock-absorbing medium in safety equipment. Their widespread application, however, is still dependent on a reduction in their production cost. Aerogels are the lightest of all solid substances. In fact, they stretch the definition of the word solid. Aerogels consist of a fine network of bubbles, with cell walls just a few atoms thick. Inside these cells is simply air, or whatever gas the designer wishes to include. Aerogels can actually be made lighter than air by forming them in an atmosphere of helium, resulting in the world's only lighter-than-air solids. The first commercial aerogels were produced in 1942 by the Mosanto corporation, under the trade name Santocel. The process involved soaking a sodium silicate solution in sulfuric acid, then repeatedly washing it in alcohol before drying it at high pressure. Mosanto described the product as "a light, friable, slightly opalescent solid containing as much as 95 percent air volume. It is a very effective heat insulating material." (Ayers, 3) Mosanto claimed to have produced aerogels with densities of 1.8 pounds per cubic foot (29 kg/m3), but their regular output was between three and five pounds per cubic foot (48 to 80 kg/m3). The following information, unless specified otherwise, comes from How Silica Aerogels Are Made, published by the Berkeley Lab. The production of an aerogel involves two main steps: the preparation of a wet gel, and the drying of that gel. The second step is the most critical, as the fluid must be removed without destroying the solid framework of the gel. This is achieved by the process of supercritical fluid drying. When a fluid is raised to its supercritical point (a specific combination of high pressure and high temperature), it exhibits some properties of a liquid, and some of a gas. This allows the fluid to boil out of the gel gently, without tearing the cell walls. The alcogels [wet gels] are placed in the autoclave (which has been filled with ethanol). The system is pressurized to at least 750-850 psi with CO2 and cooled to 5-10 degrees C. Liquid CO2 is then flushed through the vessel until all the ethanol has been removed from the vessel and from within the gels. When the gels are ethanol-free the vessel is heated to a temperature above the critical temperature of CO2 (31 degrees C). As the vessel is heated the pressure of the system rises. CO2 is carefully released to maintain a pressure slightly above the critical pressure of CO2 (1050 psi). The system is held at these conditions for a short time, followed by the slow, controlled release of CO2 to ambient pressure. As with previous steps, the length of time required for this process is dependent on the thickness of the gels. The process may last anywhere from 12 hours to 6 days. Before the gel can be dried, of course, it must be prepared. The first aerogels were made by condensing sodium silicate as an aqueous solution. Unfortunately, the process produced salts that needed a great deal of time and effort to wash out. Modern aerogels are made from silicon alkoxide precursors: compounds of silicon and simple organic mers. Although many can be used, the most common are tetramethyl orthosilicate and tetraethyl orthosilicate (TEOS and TMOS, formulas: Si(OCH3)4 and Si(OCH2CH3)4 respectively). Immersing either of these compounds in water and ethanol results in a bubbly structure of solid silicon in a matrix of an organic compound (HOCH2CH3) which is removed in the subsequent step. Because this process occurs slowly at room temperature, catalysts are used. These may be either acidic or basic, depending on the desired properties of the final product. Even with the use of catalysts, the wet gel (alcogel) must be soaked for up to 48 hours. At this point, supercritical fluid drying, as described above, is performed. Two typical recipes for aerogels can be found at the reference for this section. The chemical makeup of aerogels strongly affects their adsorbent properties. Aerogels can be made hydrophilic or hydrophobic, depending on which drying process is used. Alcohol drying (now uncommon because of the high temperature and pressure required) results in pore surfaces covered with alkoxy-groups (an oxygen atom attached to a non-polar organic mer). These hydrophobic aerogels , if sealed, are completely impervious to water, and will float indefinitely. Carbon dioxide drying results in pore surfaces covered with hydroxyl (OH) groups. When one of these hydrophilic aerogels is placed in a humid environment, it adsorbs water into its pores, up to 20% of its mass. The water may be released simply by heating the sample. These aerogels, however, cannot be used to adsorb liquid water. The high surface tension of water, upon entering the tiny pores, tears them apart. The aerogel seems to disappear; it has become a fine powder, less than 5% of the volume of the gel. Another property that is fairly obvious is transparency. Aerogels have a very low index of refraction. 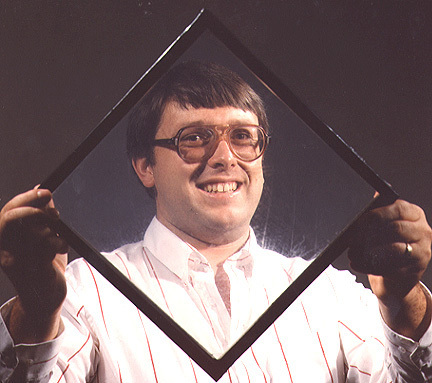 While some have a milky appearance, others are as transparent as glass. �the piece is held between two fingers and gently squeezed. The aerogel gives a little, and springs back. Then a little more force is applied and...pffttt, the piece shatters into a thousand pieces, most of which find a home deep in the carpeting, never to be seen again. Because of their transparency, aerogels may be incorporated into window panes (see Figure 2). Considering their thermal insulative properties, these window panes could be used as inspection ports in ovens, kilns, or furnaces. Because of their extremely low density, and the fact that they are not very transparent to frequencies above the visible spectrum, aerogel windows may find use in spacecraft. An under-studied application for aerogels is as a shock-absorbing material. At first glance, a brittle material that is basically 'very light glass' would seem the worst choice for such an application, but, as stated above, the speed of brittle failure of aerogels is quite different from that of most brittle materials. No material can fail instantaneously. Even a pane of tempered glass takes some time to fracture across its width. When a substance fails because of an impact, intermolecular bonds are broken one by one. Because glass is quite dense, the failure of one bond will very quickly strain the bond next to it, and failure occurs rapidly. When a bond inside an aerogel fails, it take much longer for the resultant stress to be transferred to the next bond because it is much further away. Another reason for the slow failure of aerogels is their porous nature. As the gel fails, air must escape from the pore network. The air is pressurized as it is forced out, absorbing a large amount of the energy of impact. Materials such as polystyrene are commonly used as shock absorbers. Such materials, however, have a disadvantage: they are highly elastic. When a foam bicycle helmet, for example, fails in an accident, there is a significant amount of elastic rebound, which can result in the injury the helmet was meant to protect against (although to a lesser degree). This effect is more pronounced when the impact is smaller. If the impact is not great enough to cause the failure of the helmet, all of the energy of the impact is returned to the wearer by the elastic rebound. Injuries from small impacts could therefore be worse than they would be if wearing a weaker helmet. Aerogels would solve this problem. As the graph of deflection vs. time (Figure 3) shows, aerogels exhibit almost no elastic rebound when they fail, due to their brittleness. With a load distribution curve similar to expanded polystyrene (see Figure 4), aerogels become an attractive alternative for impact-absorbing applications such as high-end bicycle and motorcycle helmets. As stated above, the greatest obstacle to the widespread use of aerogels is cost. The cost of aerogels is not inherent in their composition; silica is one of the most common minerals on Earth. The cost results from the time and energy it takes to produce them. Advances have already been made on both fronts: using alkoxide precursors has limited the amount of washing before supercritical fluid drying can be performed, and using carbon dioxide instead of alcohol has reduced the time and energy required for the drying process. In the future, other ways may be found to make aerogel production more efficient. Another way to reduce the cost of aerogels is to produce them in mass quantities. Before they can be mass produced, of course, they must find widespread application. This is a fundamental irony faced in the introduction of any new product. For example, in the 1980s a research team discovered a way of making plastic foam from cornstarch. The foam behaved almost exactly like polystyrene foam, but was fully biodegradable. This happened at the same time that McDonald's restaurants came under public criticism for their non-biodegradable hamburger containers. Unfortunately, no one managed to connect these two ideas. If they had, the mass production of cornstarch foam would have made it inexpensive enough to replace polystyrene in all of its disposable applications. Aerogels need to find an application that will allow production on a large scale to commence quickly. Safety helmets could be the ideal product. Helmets are already relatively expensive due to their strict design requirements; their cost is already in excess of that of their component materials. The introduction of aerogels as part of their structure should not increase their price beyond a marketable range. And safety helmets are produce in large enough quantities that aerogel production for them would surely benefit from some economy of scale. Aerogel helmets would still be more expensive than average, so they would not be marketed at the low-end consumer. But, for example, a marketing partnership between Bell, which makes a range of bicycle helmets, and Specialized, which makes high-end bicycles, could result in the market penetration required to make aerogel helmets feasible. Ayers, Michael. At Elevated Pressures: The Life and Science of Samuel S. Kistler. Berkeley: Ernest Orlando Lawrence Berkeley Laboratory, 2000. Ayers, Michael and Arlon Hunt. A Brief History of Silica Aerogels. Berkeley: Ernest Orlando Lawrence Berkeley Laboratory, (no date, but after 1996). (no author). Thermal Properties of Silica Aerogels. Berkeley: Ernest Orlando Lawrence Berkeley Laboratory, (no date, but after 1996). (no author). How Silica Aerogels Are Made. Ernest Orlando Lawrence Berkeley Laboratory, (no date, but after 1996). (no author). Physical Properties of Silica Aerogels. Ernest Orlando Lawrence Berkeley Laboratory, (no date, but after 1996). (no author). Silica Aerogels for Absorbing Kinetic Energy. Ernest Orlando Lawrence Berkeley Laboratory, (no date, but after 1996). Dow Chemical. Styrofoam Brand Insulation: Styrofoam Residential Sheathing. Owens Corning. Pink Fiberglas Insulation. Nanopore Incorporated. Nanogel-Based Vacuum Insulation.